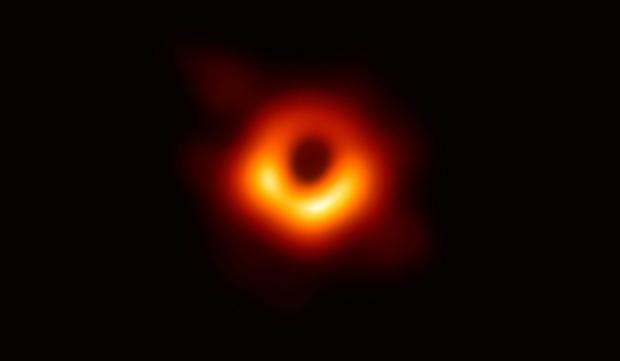 Scientists have revealed the first image ever made of a black hole, depicting a fiery orange and black ring of gravity-twisted light swirling around the edge of the abyss. Assembling data gathered by eight radio telescopes around the world, astronomers captured a picture of the hot, shadowy lip of a supermassive black hole, the light-sucking monsters of the universe theorised by Einstein more than a century ago and confirmed by observations for decades. It is along this edge that light bends around itself in a cosmic funhouse effect. In fact, Jessica Dempsey, a co-discoverer and deputy director of the East Asian Observatory in Hawaii, said the fiery circle reminded her of the flaming Eye of Sauron from the 'Lord of the Rings' trilogy. Unlike smaller black holes that come from collapsed stars, supermassive black holes are mysterious in origin. Situated at the centre of most galaxies, including ours, they are so dense that nothing, not even light, can escape their gravitational pull. This one's "event horizon" - the precipice, or point of no return, where light and matter begin to fall inexorably into the hole - is as big as our entire solar system. Three years ago, scientists using an extraordinarily sensitive observing system heard the sound of two much smaller black holes merging to create a gravitational wave, as Albert Einstein predicted. The new image, published in the 'Astrophysical Journal Letters' and announced around the world, adds light to that sound. Outside scientists suggested the achievement could be worthy of a Nobel Prize. Taken over four days when astronomers had "to have the perfect weather all across the world and literally all the stars had to align", the image helps confirm Einstein's general relativity theory, Ms Dempsey said. Einstein a century ago even predicted the symmetrical shape that scientists have just found, she said. The measurements were taken at a wavelength the human eye cannot see, so the astronomers added colour to the image, choosing gold and orange because the light is so hot. The black hole in the image is about six billion times the mass of our sun and is in a galaxy called M87 that is about 53 million light years from Earth.